Seventeen years ago, before I left for the United States, each person in my family was only allowed two spoonfuls of stir-fried ground pork for lunch due to the scarcity of meat. Today, returning to my hometown of Chengdu in the Sichuan province, I had Baozi, our beloved steamed buns with ground pork stuffing for breakfast, Stir-fried Chicken with Chili and a Meatball Soup for lunch, and a banquet for dinner. That special evening meal included Tea Smoked Duck, Sweet and Sour Crispy Fish, and Stewed Chicken with Bamboo Shoots. In the old days, these dishes were reserved for the holidays. Today, China is an emerging economy. How have these economic changes transformed the food? How have they changed life styles? What about the cuisine? With these questions in mind, I returned to Sichuan and my hometown of Chengdu and sought some answers. I also took some photographs, some of which are shared with those reading this issue of Flavor and Fortune. An ancient city, Chengdu is filled with culture and a population of thirteen million. That is lots larger than the resident size of New York City. The capital city of Sichuan Province of China, it is located on the western side of the Sichuan plain and is blessed with almost three hundred thirty-seven frost-free days. Chengdu is subtropical and has a humid climate. 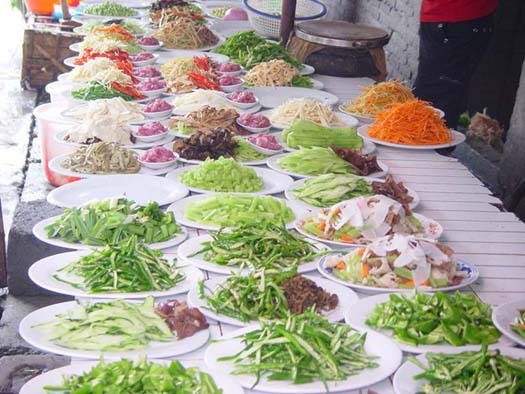 Its food supply is considered plentiful with an enormous variety of vegetables year round, as can be seen in the young ginger, silk squash, green chili, cucumbers winter melon, and other vegetables for sale there. After my first week back, everyone I met, be they friends, relatives, college or high school classmates, or chefs, proudly told me that Chengdu is rated as one of the best cities in China in which to live. Why? Lifestyles are laid back, travel opportunities convenient and easily possible, and the food considered gourmet. Almost everyone lives in their own beautifully decorated apartment, something one could not have imagined twenty years ago. I was born and raised in Chengdu, yet every time I return, I have trouble finding the street where I used to live. This time, once again, I felt as if the entire city had been rebuilt. The fields I used to pass every day on my way to work have disappeared. They are replaced by streets I never saw before. Ten years ago when I came back to Chengdu, only a few of my friends had cars. Today almost every one of them, as well as the instructors of the culinary school, have their own personal car. I was also told that the number of private vehicles in Chengdu is ranked third highest, after Beijing and Shanghai. This certainly is convenient; but it does add to traffic congestion. 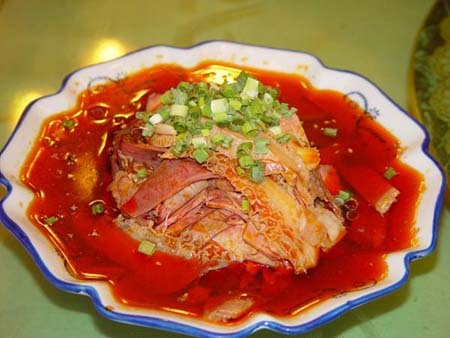 One of the biggest attractions of Chengdu is its food--hot and spicy Sichuan food. People in Chengdu love to eat. They are simply crazy about good food and they adore anything to do with food. Many are willing to drive two hours to a remote town just to taste a bowl of noodles rumored to be a well-known specialty of a certain restaurant. There are many restaurants in this city; I was surprised to learn that now there are thirty thousand restaurants in my hometown. Entire streets are packed with restaurants, more than twenty on lots of blocks. Many are elegantly decorated, have huge dinning rooms, use fabric table cloths and napkins, and have several private rooms or areas. The years we craved for meat and fat seems to have never existed. The younger generation has no knowledge of them; and in fact find that it to believe. Today, food supplies are so plentiful that huge supermarkets have popped up everywhere. In my youth, I do not remember even one supermarket. I do recall seeing foods on the street, sold by small vendors, but not as extensive as most are today. 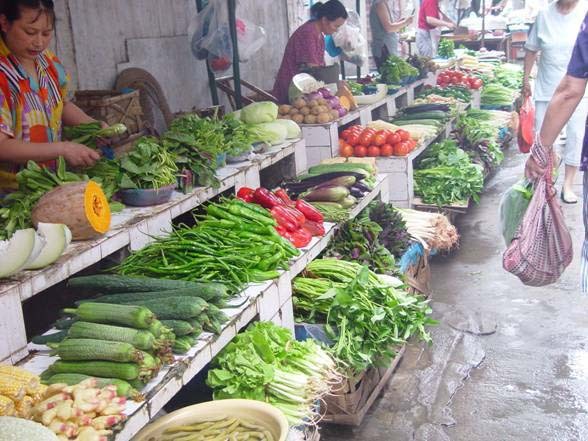 Both dry and fresh foods are plentiful on ever so many of Chengdu�s streets. The cuisine of Chengdu surely represents Sichuan cuisine, but what makes it different and unique? I think first and foremost is its use of two very distinct ingredients. They are chili peppers and Sichuan pepper. 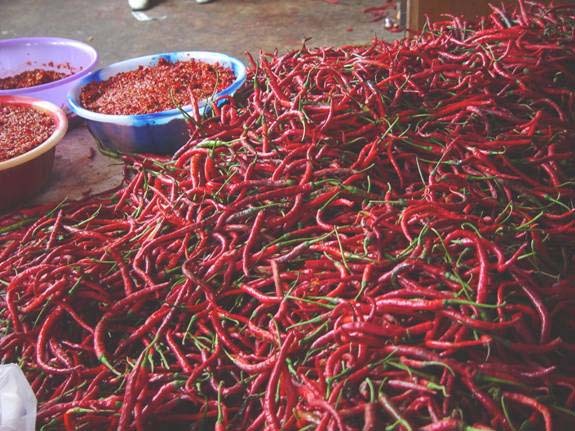 The chilies and chili products come in many forms and colors. As you can see, they often are red, fresh, and plentiful. They can also be green, dried, fried, powdered, fermented into paste, fused into oil, and more. Sichuan pepper, called hua jiao, is the dark- reddish berry of a prickly ash tree. Its taste can be described as a tingling numbness on the tip of the tongue. It is a perfect combination with hot chilies. This spicy mouth feel satisfies the Sichuanese palate. They people of this province can not live without it. French chefs use butter and Italian chefs use wine. Sichuan chefs, bold and skillful, create wonderful hot and spicy dishes with chili oil, fresh chili, dried chili, and Sichuan peppers. These signature flavors will always be at the base of Sichuan food. Indeed, the changes in Chengdu cuisine are great. I noticed that people do not eat a lot of pork. They now consume more fresh water fish, eel, snail, duck, chicken, pigeon, and lamb. Another new development is the use of many more fresh red chilies. They are used in many dishes for their crunchy and spicy flavor, their texture is somewhat similar to eating raw garlic. I also noticed other regional foods increasing in influence. Not only are Guangdong (Cantonese) and Beijing (Peking) cuisines found on menus, but delicacies from counties around Chengdu are making increased appearances. The reason for this is the population of Chengdu is changing. Now, almost half are outsiders, folks not native to this city. The following three restaurants visited help explain these new influences. I call them: The new Sichuan cuisine. YANFU-RENJIA, or The House of Salt Well is at 63 North Kehua Road in Chengdu; phone: 28-85230336 is the first of these. This very elegant restaurant serves Zigong style food. Zigong is a city two hundred miles from Chengdu. It is famous for its well-salt, and considered the capital of salt wells. The food in this city tastes stronger, saltier, and hotter than most Chengdu dishes. Heavily flavored with dried chili peppers, the dishes here provide notable contrast to the cuisine of Chengdu which pays careful attention to exact balance between hot and salty, and refined and delicate. Zigong-style foods offer wilder hot flavors and seem to conquer the palates of Chengdu diners. For example, they indulge in Red Chili Snails stir-fried with at least two cups of dried red chilies. 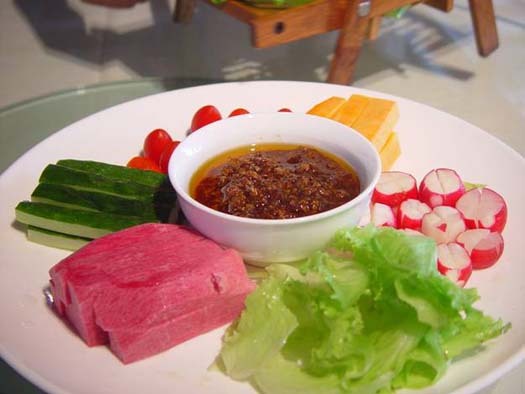 This can be seen in their Zigong Style Beef, or in the Sliced Fish in Chili Sauce, and their famous Zigong Pickles. From a seemingly ordinary glass jar of pickles come pink radishes, green stemmed lettuce, and yellow young ginger. Some also have white chicken feet and shiny fish skin. I have seen pickled vegetables all my life and do make my own in upstate New York where I now live, however, never have I seen pickled chicken feet and fish skin. After tasting these unique delicacies, I discovered the chicken feet have been boiled, deboned, and cooled before entering their pickling brine; likewise the fish skin. These delicacies are so very good! 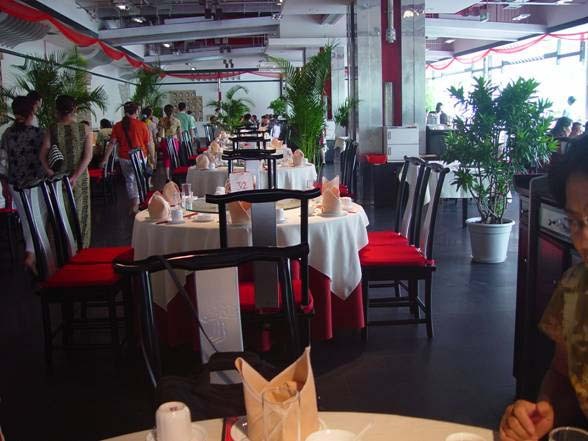 HONG-ZHAO-BI or the Red Wall Restaurant is at 363 Shuhan Road in Chengdu; phone: 28-87570002; it is the second of these restaurants, and is in a very modern building, has floor-to-ceiling glass windows, and stylish interior decor. The large dining room has potted plants around the tables offering some privacy; and the food here is considered modern Sichuan with traditional flavors. One dish exemplifying this is their Stone Cooked Catfish with Dry Chili. Its deep black platter is filled with sauce, chili oil, some red hot chilies, and green cilantro. Diners use chopsticks to take out pieces of sliced catfish so tender, they instantly melt in your mouth. I found ten smooth black stones at the bottom of the sauce, of course not meant to be eaten. Their purpose, to cook the fish and keep the sauce boiling. Another dish at this restaurant is Vegetable Harvest. This Beijing-style appetizer is an arranged vegetable platter. It tastes sweet and has pieces of two types of radishes, lettuce, carrots, and cucumber. They surround a bowl of Beijing hoisin sauce made with ground pork and a little chili powder. We also had Pig-ears Hanging on a Laundry Stick at this Red Wall Restaurant. This unique dish uses pig ears in gravy, simmered for more than an hour, then pressed and cooled. 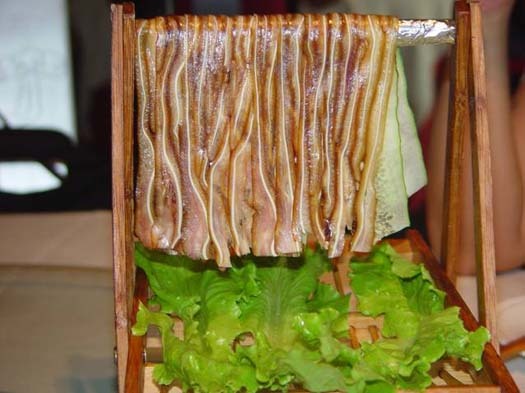 Sliced in paper-thin pieces, they are brought to the table, as you can see, hanging on a bamboo stick. The Roast Duck served at Red Wall is a combination of Beijing and Guangdong-style cookery. Typical Beijing Duck is roasted without any marinated flavor. It is brushed with maltose then hung to dry the skin. After roasting, the duck is sliced, then served with hoisin sauce and scallions. For each diner, the meat is wrapped in a paper-thin pancake. Guangdong Roast Duck is marinated with wine and salt, an important step before the duck is roasted and basted. A special liquid containing salt, wine, five spice powder, and stock is poured in the cavity of a Guangdong Roast Duck. As a result, the meat will be very flavorful but the skin not as crispy as it is in Beijing duck. The skin of Chengdu Roast Duck we had here was crispy, the meat was very tasty, and the flavor and texture were excellent. We enjoyed this restaurant's Stuffed Three Treasures. The main ingredients are stuffed bitter melon, a common summer vegetable in both the Sichuan and Guangzhou provinces, stuffed eggplant, and stuffed red bell peppers. Some might call this a Guangdong dish topped with Sichuan sauce. It tastes a little sweet and salty and it is mildly hot. MAO WU RESTAURANT is at 10 Tianhui Town in Shuangliu County, Sichuan. This third restaurant illustrates this point. It is some twenty to forty minutes from downtown Chengdu in a very small town on the side of a highway. We found it there under its name-sign, which means straw hut. In the front yard, the first thing that comes into view is a forty-inch diameter wok filled with boiling broth, pork ribs, and chicken. When we arrive, the restaurant is full. Luckily we find an empty bamboo table and pull over a couple of bamboo chairs. Before we sit down, a waitress arrives with broom and dust pan to sweep bones left under the table by previous customers. There is no menu. Another waitress arrives with pencil and student notebook in hand. We ask, what do you have? She starts to recite: Pork Ribs in Gravy, Fresh Ham with Gravy, etc. We had been told the best dish here is Pork Intestine with Gravy. The Chinese love intestines in various ways--simmered, fried, also stewed with potato. I have not eaten these foods for the seventeen years since leaving Chengdu. Since returning to my hometown for only two weeks on this trip, I already tasted Stir-fried Pork Livers, Chicken Gizzard with Gravy, and Beef Tripe in Hot Oil. The Stir-fried Pork Livers are especially delicious. It surprises me that I forgot how great they taste. Many Chinese believe eating organ meats nourish the same organ in their body. The food served at Mao Wu is common and traditional, the flavors reflecting typical Sichuan-style foods. Although the dining room here is not stylish and there are no table clothes nor napkins, the satisfaction on every customer�s face shows. As some of the above indicate, there are new dishes on menus in restaurants in Chengdu. I did notice three things that have not changed. 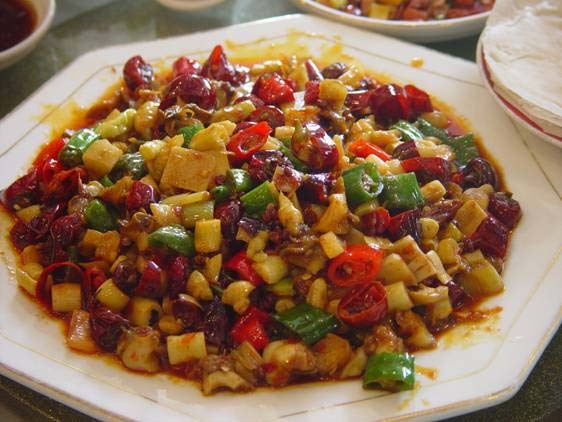 First is the basic flavors of Sichuan food, the tingling hot and spiciness which earns hundreds and thousands of diners considerable satisfaction. Second, the serving style is the same. Regardless of whether in a restaurant or at home, foods are shared family style, and dishes arrive on large platters or in big bowls. In a restaurant when two people sit face to face, there are usually three dishes to share. Most often these might include a whole fish, a plate of stir-fried pork, and a bowl of tofu. Home style food has not changed that much either. Thirdly, I believe that culinary skills for housewives or husbands have not improved much, probably because cooked food is so inexpensive in Chengdu. It seems that most people are more interested in being gourmands than in being home chefs. At food markets there is a new section called 'Plated food-�Prepared dishes.' These are for customers who work the whole day and have no time nor desire to prepare their own dinner. This solution reduces washing and cutting involved in preparing family meals. I also see many deli-like departments at each of the food markets I visit. I look at them and find Spicy Spring Bamboo Shoots, Pan-fried Tofu Salad, Fresh Lima Bean Salad, etc. How different they are compared to a New York deli, or the deli section of a New York supermarket. As China�s economy continues to grow, living standards keep improving. With a plentiful food supply, there is a greater variety of dishes, and chefs in Chengdu seem more daring in their use of oil, chilies, and sauces. The Sichuan cuisine assimilates and incorporates a greater variety of local and regional cooking styles than it did when I left. That said, the signature hot and spicy Sichuan flavor is not fading away. I think it is spreading all over the country. What follows are my recipes, rewritten for you in the style of this magazine. They and information in this article are part of a book soon to be published. This information which follows will be used in this forthcoming book; I do hope you will look for it. The first recipe illustrates the northern Chinese love of eating raw cucumber and radish with hoisin sauce. When this dish traveled to Sichuan, chefs converted it using chili powder and ground pork in the sauce. They give the palate a little sweet, a little spicy, and a bit of salt. The crunchy vegetables make your mouth water. The second recipe, Stone Cooked Fish Filet, indicates that though the Chinese love to cook fish whole with skin on and bone in, some restaurants and homes now use sliced fish fillets. They also use shiny rocks preheated to cook the fish and preserve the temperature. No rocks, no problem. An alternate solution is offered. 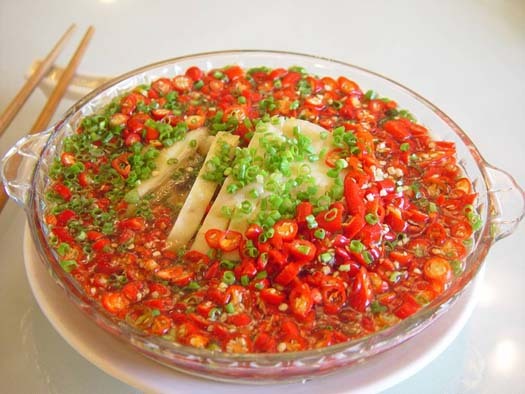 In the third recipe, the fresh chili is sharp, raw, spicy, and piquant; it shows a taste different from dry chili powder. During the past few years, crunchy fresh chili is a popular Sichuan chef�s favorite spice, and dishes can contain lots of them offering vivid color and fresh hot taste. Do be aware: Everyone does not eat all of them. Shirley Shuliang Cheng, M.S., C.H.E. is Professor of Culinary Arts at the Culinary Institute of America in Hyde Park NY. Her Masters degree is from Johnson & Wales University in Providence, RI and her Bachelors and Associates degrees are from China's Sichuan University in Chengdu, Sichuan. In China, she was a Certified Chef-Instructor at the Sichuan Culinary Institute, and an Executive Sous Chef at the Xingsheng Restaurant in Beijing. In the United States, her awards include the Marc Sarrazini Cup as member of the CIA team at the Salon of Culinary Arts in New York City in 1996 and again in 1997; and she was the 1996 Faculty Member of the Year at the Culinary Institute of America. 1. Heat a ten-inch fry-pan on medium heat, and when hot add the ground pork. Stir-fry until no longer pink, about three minutes. 2. Add chili powder and cook until the oil turns red, then add scallions, sugar, and hoisin sauce, and stir well before adding two tablespoons of cold water and the sesame oil. Mix well, then serve surrounded by the raw vegetables listed in this recipe. 1. Marinate the fish in mixture of hot bean paste, chili powder, sugar, rice wine, soy sauce, and the cornstarch for fifteen minutes. 2. Place one large or several smaller stones in the oven at 450 degrees F for thirty minutes. 3. Preheat the pan then add two tablespoons of the oil and add ginger and the vegetables, and the salt and pepper. Remove them to a heat-proof bowl. 4. Place heated rocks in the ceramic bowl on top of cooked vegetables; then add marinated fish fillets on the stones. 5. Preheat the remaining oil and pour it over the fish. Stir a little, then put cilantro on top and serve immediately, placing the dish on a hot tile. Note: If stones are not available, add the marinated fish fillets on top of the cooked vegetables. Pour the hot oil over them and then put the heat-proof bowl in pre-heated 375 degree F oven for five to seven minutes. 1. Place game hen or the chicken in a one and a half gallon pot. Add cold water to just cover it. 2. Add ginger, scallions, and rice wine. Bring to the boil, then cover the pot and turn off the heat. Let it steep for thirty minutes. 3 Remove, rinse in cold water, and allow to cool. Then de-bone and cut game hen meat into one inch wide and three inch long strips. Place on a deep plate. 4. Prepare the sauce by combining the sugar, salt, white pepper, soy sauce, and chicken stock in a bowl. Mix well. 5. Mix fresh chili peppers with minced scallion and set aside. 6. Heat up the oil in a small pan then pour it over the chili and scallion mixture. Then pour th sauce over the game hen, and sprinkle the chili, scallion, and oil mixture on top of chicken.